The voluntary carbon markets have served as the testing ground for compliance programs all over the world, even moving forward when efforts to implement mandatory cap-and-trade programs stalled. This has led to the voluntary markets having an influence that extends well beyond the nearly 1 billion offsets transacted over the last decade, according to Ecosystem Marketplace's latest State of the Voluntary Carbon Markets report. June 3, 2015 | Washington, D.C. | When the international negotiations take center stage in Paris this December in hopes of reaching an agreement to rein in climate change beginning in 2020, negotiators will be able to draw on the lessons learned in the voluntary carbon markets, according to a new report from Forest Trends' Ecosystem Marketplace. 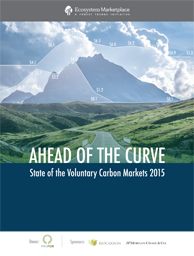 Companies, governments, and individuals voluntarily spent just under $4.5 billion to purchase nearly 1 billion carbon offsets from projects that halt deforestation, install renewable energy, promote energy efficiency, distribute cleaner-burning cookstoves and more, according to Ecosystem Marketplace's "Ahead of the Curve: State of the Voluntary Carbon Markets 2015" report. National and subnational government officials have leaned on the experiences of the voluntary markets in building their compliance programs, meaning the voluntary markets have influence that goes beyond their relatively small size. For example, the offset component of California's cap-and-trade program was largely built on project methodologies initially tested in the voluntary markets, which paved the way for pre-compliance offsets to flow into the regulatory program despite a year-long postponement to the program's launch. And South Africa's carbon tax, currently scheduled to begin in 2016 after also being delayed, will welcome domestically sourced carbon offsets generated under the Gold Standard and the Verified Carbon Standard (VCS) -- stalwarts of the voluntary markets. "However, while compliance markets have turned to the voluntary markets for inspiration on project types, standards and more over the years, this relationship is a two-way street in that the voluntary markets take demand cues from developing compliance markets and proposed legislation and regulation," said Kelley Hamrick, Carbon Program Associate at Ecosystem Marketplace and lead author of the report. This is most clearly reflected in the pricing of voluntary carbon offsets, which has experienced peaks and valleys driven by policy signals (or lack thereof). The global average price peaked at $7.3 per tonne in 2008 as momentum appeared to be building toward the United States implementing a national cap-and-trade system to reduce these emissions. But prices began to decline in subsequent years as carbon-trading legislation faltered in the U.S. Senate. The global average price has consistently fallen since 2011, when it became clear that nations would fail to ratify another phase of the Kyoto Protocol, to reach an all-time low of $3.8 per tonne. Historically, the average price of voluntary offsets is $5.8 per tonne over the decade Ecosystem Marketplace has tracked these projects. "With few positive policy signals in the carbon markets in 2014, the year witnessed the voluntary market's lowest average price per tonne on record -- sending a clear signal to policymakers in the lead-up to the Paris talks," Hamrick said. From year to year, the project type most in demand has evolved, driven by policy signals and supply-demand fundamentals, according to the report. In 2009, landfill methane projects experienced the highest transaction volumes as U.S. buyers bet on these projects becoming eligible for the national cap-and-trade market being debated at the time or in California's developing cap-and-trade market -- a gamble that failed to pay off on both counts and created a major oversupply of these offsets. In 2011 and 2012, wind projects topped the charts due to their relative cost-effectiveness compared with other project types -- the price differential being critical to European buyers, the primary purchasers of voluntary offsets, who were trapped in a major economic crisis at the time. In recent years, however, REDD (Reduced Emissions from Deforestation and Forest Degradation) offsets have overtaken wind as the dominant project type, trading at an all-time high of 25 million tonnes in 2014, in large part due to funding from public-sector entities in Germany and Norway committed to avoiding deforestation in tropical countries. Through the "REDD Early Movers" program, these European governments are funding avoided deforestation in Brazil's Acre state and nationally in Ecuador and Colombia. These "payments for performance" are not offsets, meaning countries cannot deduct the reductions from their own emissions, but they rely on traditional carbon market infrastructure, and represent the kind of government-to-government deals that may become increasingly common. These agreements contributed $90 million to 2013 and 2014 market value. "I think that [public-sector involvement] is something that is going to continue, which is good," said Agustin Silvani, Managing Director of Carbon Finance for NGO Conservation International. "But what worries me is that many of these initiatives say they want to attract the private sector and they want to work with the private sector, but there is no mechanism for the private sector to engage, which is frustrating for the project developers. It's worrying because if not designed correctly, it could crowd out whatever private finance is there instead of seeking ways to leverage it." Deforestation contributes up to one fifth of global emissions annually, and hundreds of companies are committing to purge deforestation from their supply chains. As international climate negotiators debate the potential inclusion of REDD offsets in a potential agreement emerging from the Paris talks, it is noteworthy that REDD offsets now have a slight edge on the list of most transacted voluntary project types with 84.5 million tonnes compared with the 84.3 million offsets transacted from wind projects over the last decade, according to the report. "Whatever comes out of Paris will most likely not be super-robust in terms of a globally legally binding agreement," Silvani said. "It's going to be a series of pledges and contributions, but nothing top-down like Kyoto. How does REDD form part of that? I think that remains to be seen, but it will be a big part of some countries' national contributions, and everything is positive for REDD to continue." In 2014, the volume of offset transactions rose 14 percent from the previous year to reach 87 million tonnes, from the 76 million tonnes tracked by Ecosystem Marketplace the previous year. However, the overall value only rose 4 percent to $395 million, according to the report, as a result of the average price shrinking to $3.8 per tonne from $4.9 per tonne in 2013. Offsets from household devices (cookstoves and water filtration) retained the highest average price by project type at $6.4 per tonne -- although the price of these offsets also declined from the previous year's $8.7 per tonne average. Avoided deforestation offsets led the pack in 2014, guided by the $50 million to reduce deforestation in Ecuador through the REDD Early Movers program. Renewable energy projects were also in demand, with nearly 14 million offsets transacted last year, according to the report. Countries that will play critical roles in the Paris talks have received notable shares of the voluntary financing pie for carbon offset projects. Over the last decade, the United States took the gold in terms of voluntary offset transactions, with the largest volume at the highest prices of any country (136 million tonnes of offsets, valued at nearly $700 million), owing partially to the preference that domestic buyers such as automaker General Motors have for U.S.-based projects. Brazil, which will play a key role in the discussions on REDD, takes the silver (40 million tonnes, valued at $233 million) due in part to the commitment of the government of Germany -- another major player in the Paris talks -- to pay the state of Acre to avoid deforestation in its jurisdiction. Turkey -- not expected to be a major player in the international talks -- takes the bronze (32 million tonnes, at $207 million) as home to most of the renewable energy offsets supplied to European buyers -- the largest regional purchaser of voluntary offsets over the last decade. Several least-developed countries have also benefitted from voluntary carbon finance, including Cambodia (4.3 million tonnes, valued at $40 million) -- home to Terra Global Capital's Oddar Meanchey forestry project, which has received financing courtesy of software giant Microsoft's internal carbon fee program. The Democratic Republic of Congo -- home to the second-most forested area in the world after Brazil -- has also benefitted from voluntary carbon finance (4.6 million tonnes, worth nearly $21 million). This blog post originally appeared on Ecosystem Marketplace. Click here to read the original.